Bringing it all together, or not really? The last few days have seen a few tough months of training take the wind out of me a little. I know I have complained about my chilblains all winter, but the last few weeks I had to succumb to another cycling inflicted devil that is the saddle sore. Unfortunately it wasn’t from bad seat position, it was just an infected hair, turned boil, turned horrid pustule of a thing. So antibiotics and a few days rest was what the doctor instructed. Ugggh! 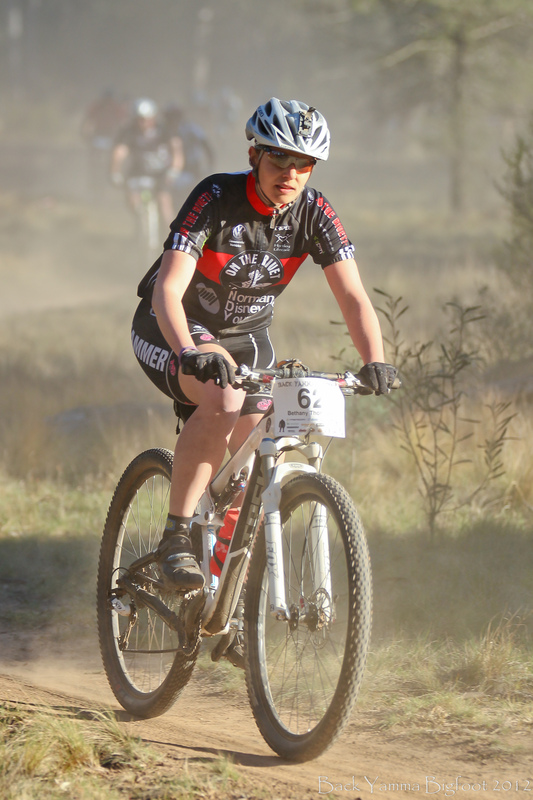 On Saturday I was back on the bike for a mad fun lap of Stromlo before jumping in the car and heading out for the fabulous Back Yamma Bigfoot 100km! A fun roadtrip with Mr Ed McDonald and Cam to the Back Yamma State Forest for a blistering fast lap of the 100km course. The course is notorious for hidden tree stumps and sandy corners, so I took it pretty easy. The goal was to get around, test the legs and the bike as a last hit out before Mongolia. In a pretty good ‘taking it easy time’ of 4:48, I was stoked. Plus I got some decent cash in the wallet, a new tyre and a wicked Bigfoot trophy! If you ever get the chance to race the Bigfoot, I highly recommend it. My writeup of the event last year is here. Fast, dusty, furious and awesome! They desperately need more chicks to participate too. Nothing technical about the course and only 1 or 2 little hilly bumps – why wouldn’t ya?? So yesterday I started my Mongolia packing mission, with a little sniff here and there. Yesterday morning the throat was sore and the head was heavy. Today it is clearly the flu with fever and chesty cough. Perfect prep! Hopefully by Sunday I will feel ok to ride!!! So, apart from a less than ideal last few weeks, the base is there and the intensity is there, so I can’t wait for this amazing adventure to begin. You can follow us on the website: http://www.mongoliabikechallenge.com/. Last year they were very good at providing race updates, as there won’t be any mobile reception for us to be doing that on the Mongolian Steppe! 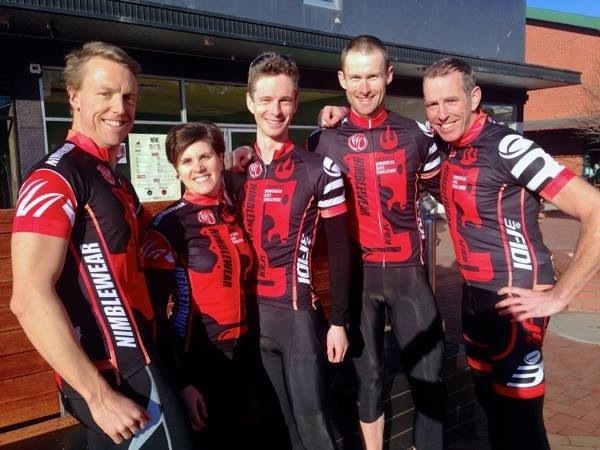 Nathan Versey, Robert Bleeker and I are riding together for 3FIDI-NIMBLEWEAR 1; Seb, Maria and Cam are 3FIDI-NIMBLEWEAR 2! This entry was posted in BikingBethany and tagged Back Yamma, Bigfoot, Mongolia bike challenge, nimblewear, saddle sores on August 28, 2013 by bethany. The last few years I had heard stories of a relaxed race out in the sticks that was well priced, fast paced and super fun. The name sounded funny and unfamiliar to me and we just ended up referring to it as “that big mumma race”. 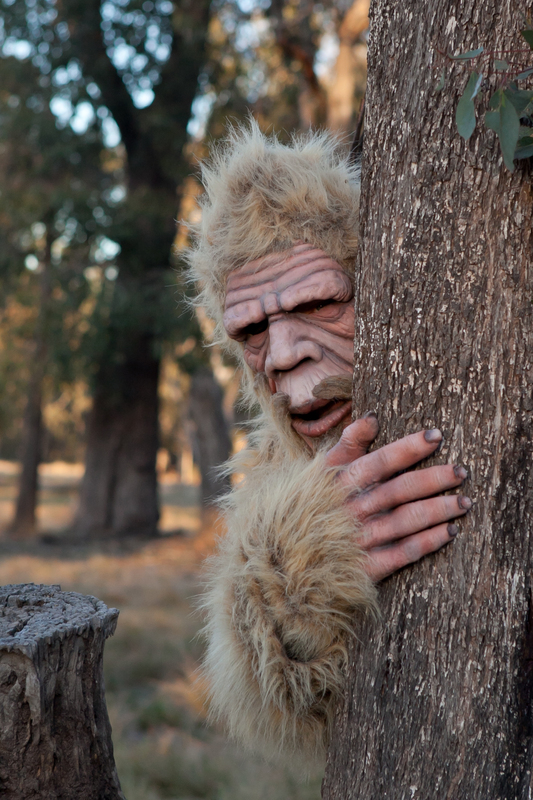 So this year with the promise of a lift, a campfire and astronomers from Parkes to point out pretty stars, I tracked down the proper name “Back Yamma Bigfoot” and headed off see if this race would live up to the stories. The short answer is: Yes, that race was awesome! We arrived just before dusk on Saturday evening. I must admit I was impressed with the event centre which was pretty decked out for the middle of nowhere. The Rotary guys had put on a feast and there was even a generator running all night just to keep the ice-cream cold 😉 Camping on the edge of the trees meant plentiful firewood and the cypress pine made for wonderfully scented smoke. Note to self: bogans with beer cans and handheld stereos have no idea how to light or maintain fires, do not camp near them in the future, they might set the forest on fire. Morning brought a cool breeze but plenty of glorious sunshine though as the start gun went off the daylight disappeared into an eerie world of dust. That first few kilometers I literally could not distinguish the ground from the sky and was riding blind in a white dust storm surround by a swarm of frenzied riders. Dangerous ruts and dust-clogged corners brought out the cautious in me and I eased off and waited out the craziness. Eventually the field spread out and the 29er started gobbling up riders. My legs felt great, the single track was fast and the firetail even faster. As I got used to the fact that pretty much all potentially dangerous stumps were painted pink (except one Ed found), my confidence increased and I cranked it up a few gears. Awesome fun! After a lap of eating dust and tearing along with Al and Libby, the bikes were sounding very average. Numerous times I found myself smirking at the crassness of a classic saying from The Seb “as dry as a nun’s nasty”. Terrible. Anyway, Lib’s jockey wheel decided it had eaten enough dust and wanted to retire. She made it back to the 50km point but enough was enough. Meanwhile, Al had rocketed off through some of the faster twisty single track which unfortunately left me in no man’s land. To top off a great day, I paid my $3 and had a hot shower in the middle of the field; turning me from what appeared to be a Beth-esque looking Bigfoot to a semi normal looking Beth. Unfortunately at preso there was a bit off a stuff up with results and I was awarded third when really I was forth. Somehow they seemed to think the women’s open winner Michaela didn’t even exist! Anyway, it all worked out in the end and I got a consolation tyre (albeit an all-mountain) for making me get up there. I was happy with fourth! In the last month I have learned that a weekend with Al Usher isn’t complete unless there is something to make things a bit more epic. This weekend was no exception, although this time it was through no fault of his. 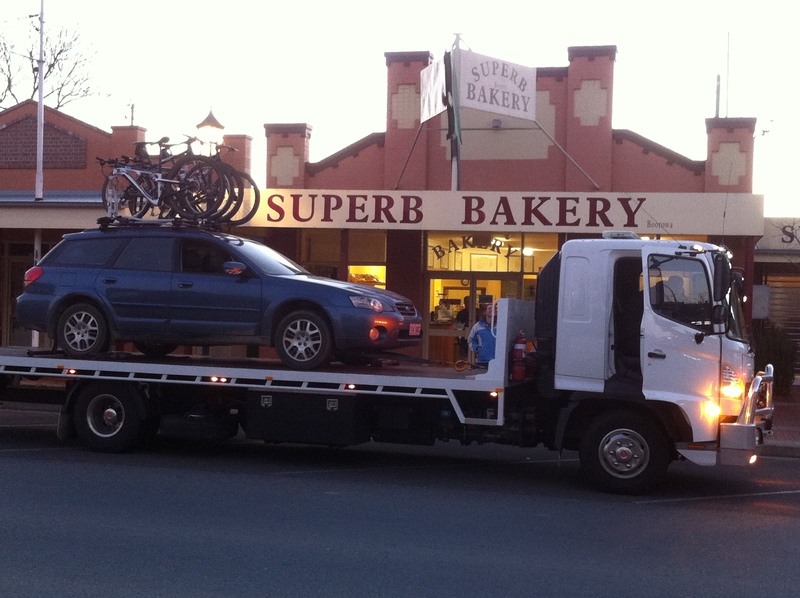 After replenishing our weary bodies at the Boorowa “Superb Bakery”, Al turned the ignition key and with some crazy noises from under the bonnet, including impressive smoke, that was the end of trip for the subie. That will teach us to stop for bakery treats! We got the car towed, bikes and all, to the local garage and sat down to a $12 roast and dessert. We were rescued by The Seb, to whom we owe a very big thanks for coming out on his Sunday evening to rescue us. 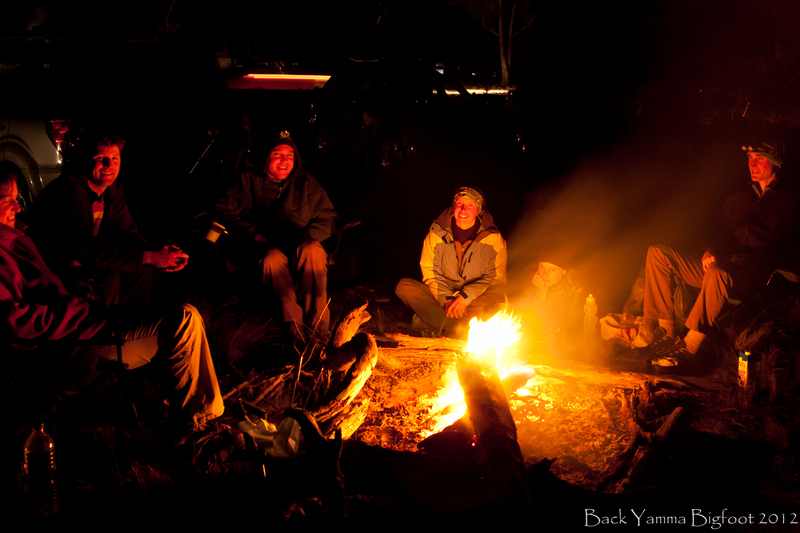 Big thanks to the Back Yamma BigFoot crew for a great weekend out. It really was an awesome event which lived up to all the stories I had heard and I can’t wait to come back next year and get that third place for real! Also thanks to On the Rivet, who had my suspension working much nicer without the “orange goo that did not resemble oil” that you mentioned after the last bit of TLC for the Superfly. 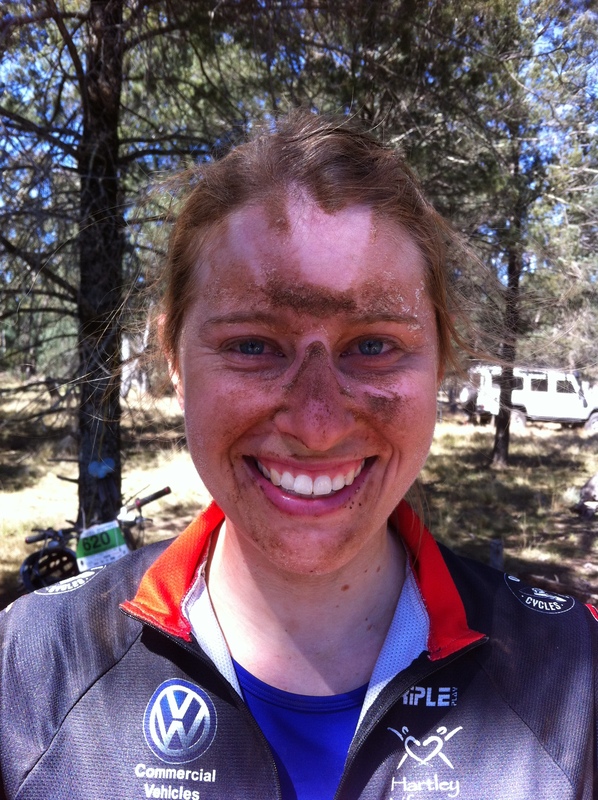 This entry was posted in BikingBethany and tagged Back Yamma, Bigfoot, races on September 10, 2012 by bethany.